If you're looking for a mild lift for just the rear of your truck, you've come to the right place! Traxda rear lift kits are an easy solution that is easy to install, safe to use, and best of all, they maintain factory ride quality. 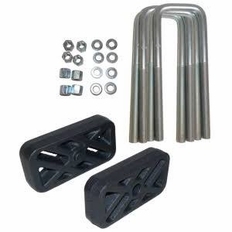 Proudly made in the USA, this Traxda Rear Lift kit achieves lift for your truck with new lift blocks and extended U-bolts. This safe, simple, and effective solution is something you can probably installcyourself in your own garage. Your Traxda rear lift kit will come with everything you need for a quick and easy installation. All necessary hardware, as well as detailed instructions that include photos, alignment specs, and a Lifetime Warranty are included. The part number for this Traxda rear lift kit is 404086 and it fits 1999-2006 Chevy Silverado 1500 2WD, GMC Sierra 1500 2WD models. It lifts the rear of your truck 1".